The other one by the window succumbed to my sons' miniature digger truck while I was away. Real dirt inside the house is just too much of a temptation to a 2 year old and 4 year old, I'm afraid. Soooo, I'm going back to fake for this edition of Frugal Friday. Would it have been more frugal just to go with fake in the beginning? Yes, but that would be too easy for Melissa. She always seems to make things more difficult than they need to be. I found these big boxwood balls at TaiPan for 9.97 a piece. I was thrilled at that price, because I have priced them on the Internet, and can't find them for less than $18 a ball. We're not stopping here though, because I have two little spots I need a green touch to. Soooo, get out you're scissors! We're going to cut this beauty up. It actually came apart in half quite easily, then I cut another third off the half. What are you doing, Melissa?? 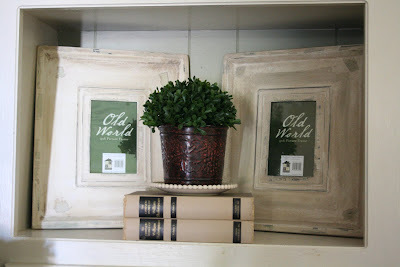 You see, it's not that bad...a little greenery here, (frames are from Rod Works in Utah and need pictures, books from a yard sale, container from the Dollar Tree, little plate from Kohls) a little greenery here, and I still have some to spare. All from that beautiful boxwood ball. Fake, yet frugal...love it. And much more durable with the digger trucks~they've already been tested. Oh, and yes, I did replace the poor 4-legged starfish with this one. I was at the Hob Lob this week, and they are having a big old basket clearance. Call yours before heading out and see if they're doing the same thing at yours. 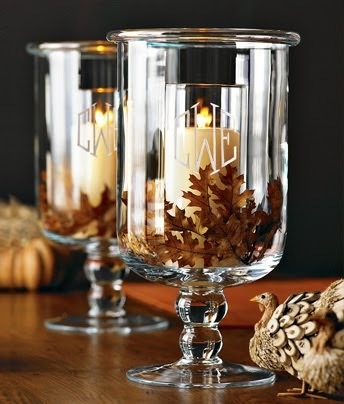 Aren't they very Pottery Barn-ish? They are 67% off, making for some great prices. Big one was 5.33, medium 4.33, oval was 2.99, little ovals were 1.67. I thought the little ones would be great for forks, spoons, and napkins at bbq's this summer, so I got three. I'm sure they'll eventually go 80% off, but I didn't want to risk them not being there. When I saw them in the main aisle, I wasn't that impressed. But, when I was in the fabric section, my eyes were drawn up to the top shelves and there were lots of lovelies up there. So, look up and around your store! 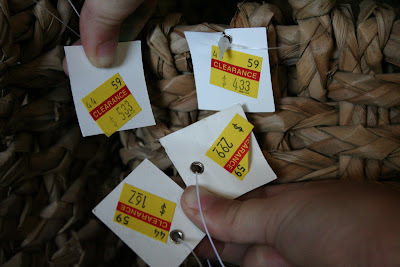 Also, you'll want to call your Old Navy to see if yours is doing the add'l 50% off their clearance prices this weekend. You know I love these sales, AND if you go to http://www.oldnavyweekly.com/ you can scout around for some coupons to print off and use on top of the sale. Sweetness! I'm so excited. More frugal-ness over at the Shabby Nest! But if it does, at least I will know what to do. Love what you did with that boxwood ball! Thank you for the fakeness inspiration! I don't have a green thumb. I was just at Home Depot today and bought some greenery to replace some that died. It's a cycle of mine. So I'm going to check out Michael's and see if they have some fake stuff to play with! Crazy clever! I never would have thought to cut that up! Talk about making the most of something. Especially love it sitting on the stack of old books. hee heee - I love your frugal fakeness. :) Great post. Sorry about your succulents..not so succulent after all. 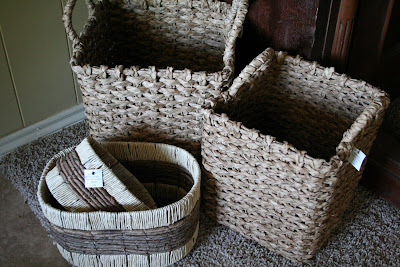 I love love love those baskets and am definately going to check my Hobby Lobby, thanks for the tip! 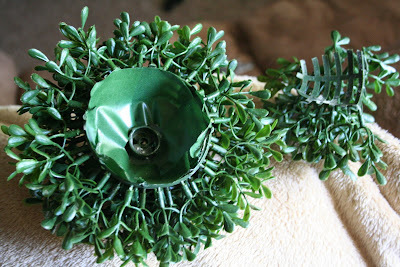 Also your greenery idea is great! 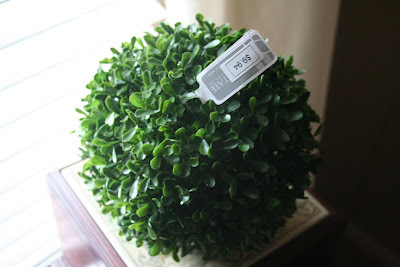 I never thought of cutting up a topiary ball and using it in a few pots. Love it! You are so brave to cut up your ball. But it turned out fabulous!!! (Like I had any doubts.) Your baskets are great finds as well. Too bad I don't have a Hobby Lobby. Boo hoo! love the tip on cutting up the greenery - I'm not sure I would be brave enough until I read your post! Wow. Now this post is chock full of GREAT ideas. I'll have to check out that sale at Hob Lob! Love the boxwood. well...since i can't keep any plant alive...this seems like a nice alternative. Hey Melissa...thanks for the great ideas...and all the heads up on great bargains...you are an amazing thrifty shopper!!! An INSPIRATION! I love those baskets - I'll need to stop by HL today, if I can. What a clever idea! Love it! Definitely gonna have to hit up Hob Lob and check out the baskets! Those are amazing. So wish I had a Hobby Lobby or Tai Pan remotely close to me. love that idea! I was just going to by a succulant. 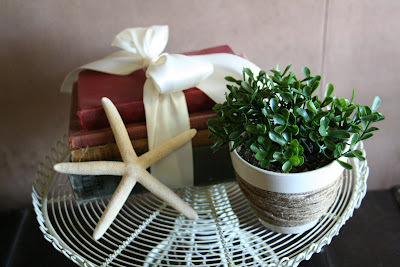 I also love the ribbon tied around the books with the starfish next to it. and as far as the basket are concerned, they are soooo cute I'm on my way to hob lob today I hope the sale is here in Georgia, but if not they still have to be cheaper than PB! Isn't Hobby Looby Awesome?!!! I landed on the same sale last week. Now I have a few more baskets than I know what to do with. 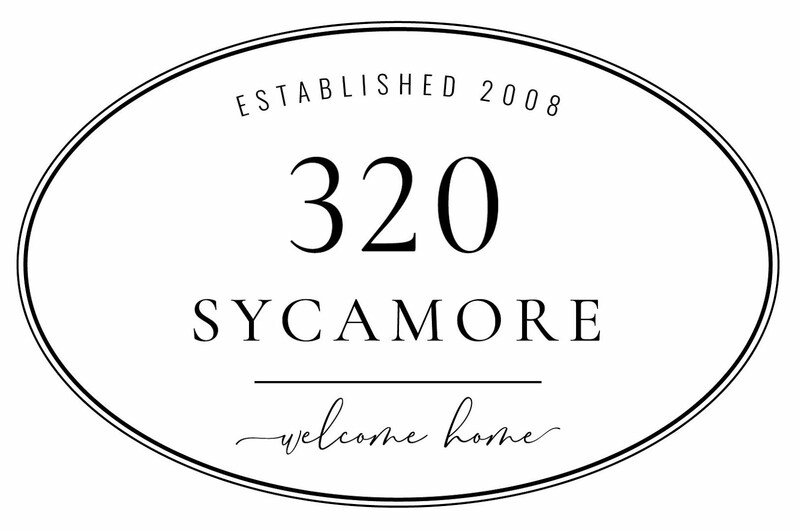 just fyi...i am having a sale at my blog! go check out the goodies!! Great idea! Don't have a TaiPan here but I can now be on the look out! As for Hobby Lobby-- where to begin?? I did gasp outloud when I saw that you were cutting up the ball, but as usual, there is a METHOD to your MADNESS!! :) Love it all! Oh such a great idea! Missed the baskets at Hobby Lobby, darn. 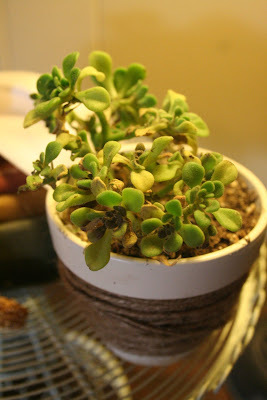 Good thing about suculents is they look EXACTLY like the fake ones! The greenery looks great! Love it. Going green without the hassle! : ) Great basket finds at HL. I guess I better make a call to my local store and find out about that sale! Woohoo! Wowzers! Some great finds this week!Thanks! LOVE those baskets...wish I lived near a HOBBY LOBBY!! I have a hard time with succulents, too. They are supposed to be easy to maintain !!! HA! I love Hobby Lobby, too! I just love that you cut up your greenery ball. Way to totally think outside of the box...err...ball. And I'm totally LOVING the big square baskets you bought. Totally gorgeous! WOW! You took a little, to buy a lot, to make a lot of little. This was a great idea. Thanks as always for sharing. Really, really great finds! You have an eye for great bargains and then how to turn them into something fabulous. Thanks for Old Navy heads up- I went yesterday and stocked up on bigger size clothes for the kiddos. Can't beat an additional 50% off! Wow - I just found some great blogs right up my alley - yours included. Thanks for the inspiration! Love your frugal tips! And - I'm on a mission for some greenery now this week! You are brilliant! I love your fake plants and the little vignettes you put them in.